The DSI Sense will help you with your year-round skin-care needs by monitoring the magnitude of indoor skin stressors caused by changes in humidity and temperature. The primary method for hydrating skin is the application of moisturizing creams and lotions. Occulsive compounds that form a surface film or barrier layer that inhibits the transport of water from skin to ambient air. Humectants are hydroscopic or water-loving substances that draw water from deeper in the skin or ambient air to the stratum corneum. Emollients target the spaces between corneocytes so as to improve skin smoothness. Depending on their composition and the application amount, they may also serve as a moisturizing ingredient. Most moisturizers consist of water/oil mixtures and thus they must also use emulsifying agents to prevent their separation. Try purchasing a moisturizer in a small size, and then use it for a few weeks to see if it works for you! 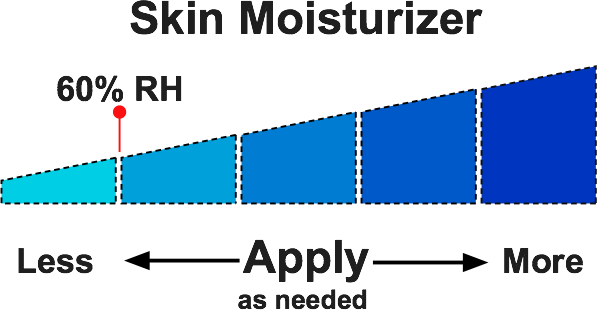 To help guide the application of lotions based on current indoor humidity, SkinSaver calculates the relative amount of a barrier cream or lotion needed to inhibit (resist) the loss of dermal water and reach a target 60% RH at the surface of the stratum corneum. As ambient RH decreases below 60%, the need for a barrier lotion increases in order to maintain skin hydration. BUT, the combination of your skin properties and the barrier effectiveness of the lotion you use makes your skin-care situation unique—SO, over time you will have to personally gauge the amount of cream/lotion you apply in response to the bar graph. A room humidifier operating in your bedroom at night will hydrate your skin while you sleep! SkinSaver provides alerts as to when a humidifier would be beneficial. The adjacent plot shows how a room humidifier can increase the hydration potential of indoor air from "very dry" to "moderate". Room humidifiers should be operated to keep humidity levels between 40 to 60% as higher levels can promote mold formation. A secondary benefit of the increased humidity provided by a room humidifier is a possible reduction in dry-eye symptoms. See the increase in relative humidity as a humidifier operates. Use a humidifier with a WeMo smart plug to turn it on at bedtime for night time skin hydration! Your daily UV exposure depends on your time outdoors and the time-varying UV intensity during the exposure period. UV Protective Measures: the chief goal in managing UV sunlight exposures is to minimize your skin cancer risk as well as long-term photodamage to skin—not just to prevent sunburns. The effectiveness of a sunscreen in preventing skin reddening is measured by its sun protection factor (SPF). The higher the SPF value, the greater its protection against sunburn, which is due mainly to UVB radiation. Importantly, sunscreens that are labeled “Broad Spectrum” also afford protection against UVA radiation. The combined UVA/UVB protection provided by broad spectrum sunscreens helps reduce skin cancer risk and photoaging when used in conjunction with other UV protection measures.